Benjamin Franklin once wrote, “A lie can travel around the world in the time it takes the truth to put on its shoes.” Like everything else, the internet has sped up this process. With the power of social networks, misinformation can spread faster than ever. However, Facebook is looking to slow down the spread of hoaxes on its network. Facebook recently announced a plan that will mark and reduce the reach of fake news stories on the network. In a blow to internet pranksters, Facebook will begin marking stories that contain false information and limit the reach of accounts that consistently send out hoaxes. As we’ve mentioned in the past, Facebook has a difficult challenge in deciding which of the hundreds of possible posts that can go onto a user’s News Feed should be shown. In 2014, the company began restricting the reach of link bait, engagement baiting, and certain kinds of spammy content. This new policy will target stories that are false. Facebook won’t be removing content for this reason. The company noted they aren’t going to actively fact check each post or linked article. Rather, when a certain post is flagged enough times (or percentage of times), it will automatically being marked with “Many people on Facebook have reported this story contains false information”. So the system will mostly rely on the feedback from Facebook users to determine what gets flagged. 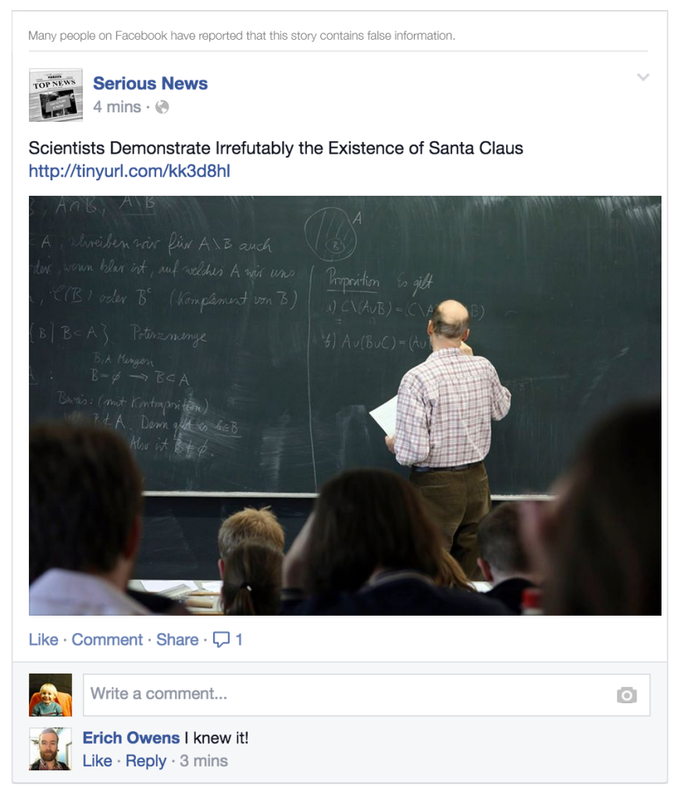 It’s important to note that Facebook intends to draw a distinction between a hoax and satire. Many content producers create satirical content that is untrue but written in such a way for the purpose of humor, irony or to make a point. The main difference between a hoax and satire is that satire is usually makes it clear that the content is untrue. Satirical content producers, like The Onion, shouldn’t see their distribution decline in response to this change. Regardless of Facebook’s reassurances, there are reasons for marketers to be concerned about this policy change. First, the line between a hoax and satire is very, very thin. Most people who create fake information for hoaxes usually claim they do it to prove a point about gullibility. So there’s a possibility that a content producers earnest attempt at satire could be misunderstood and get reduced distribution as a result. A second concern is for companies that deal in controversial topics or have a brand perception problem. People may flag their stories as false when the information is debatable. To illustrate, an article about living conditions in Palestine or the health effects of GMO foods could generate a lot of false claims from anyone opposed to the stance of the author. Similarly, a company with unhappy customers could find their posts about products, sales or specials marked as possibly false. Undoubtedly, Facebook has put countermeasures in place so this doesn’t happen to the content from large businesses like McDonald’s or Monsanto (whose content would be targets for opponents of the company), but smaller marketers should be on the lookout to see how the system is implemented and if their content is effected. In the press release, Facebook indicated that only a small amount of marketers would be affected by the policy change. The company said that testing showed “that people tend not to report satirical content intended to be humorous, or content that is clearly labeled as satire”. This policy change is more evidence that the future of marketing is in creating quality, honest content. Relying on hoaxes, link baiting, or any other trick to generate interest will become a less effective tactic in the future. For more information on this changing trend for content producers, read this article on why your content should be your edge.